Have you been looking for a capable midsize SUV that you can use on a regular basis? If so, visit Burns Honda in Marlton, NJ and check out the 2016 Honda Pilot. 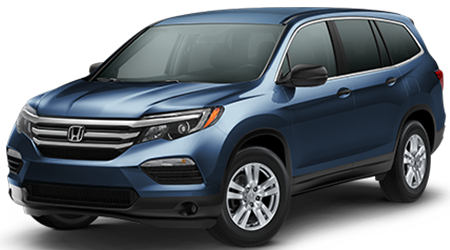 The new Pilot is now better than ever and our dealership has a large selection of them for drivers to explore. Burns Honda has proudly served Mount Laurel, Cherry Hill and Medford, NJ for a number of years with Hondas at a great price. Visit our dealership at 325 Route 73 for a first-class experience and check out the new Pilot today. The 2016 Honda Pilot is all-new from the ground up. Major changes on the outside include a sleek, modern design that ditches the previous models’ boxy exterior. The SUV also benefits from a refreshed interior that features high-end materials, satin finishes and soft-touch surfaces. With these changes, the new Pilot is more luxurious than ever and will stick out of the SUV crowd. For 2016, the Pilot also receives a new engine underneath the hood. The SUV now packs a 3.5L V6 making 280hp underneath its hood and can put the power down through its front wheels or all four. The engine features all of the latest technology, which includes advanced fuel injection and auto start-stop to achieve better fuel economy and more power. There are two transmissions that drivers can explore, which include the six-speed automatic transmission or the nine-speed automatic. With a new engine, a new transmission and a new all-wheel drive system, the new Pilot can tackle a variety of tough jobs. If you’re searching for a midsize SUV that can handle all of your tough jobs with ease, then head over to Burns Honda in Marlton, NJ and explore the 2016 Honda Pilot. The new Pilot has received a complete overhaul and is better than ever. For a great deal on a new Honda, stop by Burns Honda at 325 Route 73 and experience the new Pilot today.